It's back, it's shiny, and it's going together! It's back from the polisher and ready to put back together! Let the fun begin! 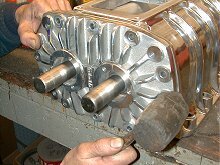 We will cover in detail how to rebuild your 671 blower as it is rebuilt by 30 year blower service veteran, Everrett Hohn (E&R Blower Service). This blower has 5 ¼” rotors instead of the “normal” 5”. Everrett tells me it makes this blower a 6110 for what it's worth. He guesses the birth date of this blower to be sometime in the early 50's. If you saw the first blower article where we cut the mounting tabs off, you might recall there were two of them about 2” long. Older 671 blowers (1940's) have one long tab. The newer ones have other distinguishing features, but I won't get into that now. 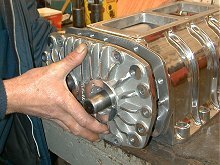 Everrett bead blasted and cleaned the rotors and has cleaned up the inner case, so we're ready to begin re-assembly. 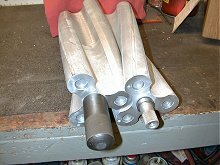 “Wedding Rings” are first pressed on the shafts. These are what the seals run against. DO NOT oil or grease these seals! It will ruin them. They are designed to run “dry”. The left one in this photo has a ring installation tool on the shaft. The rotors are then inserted and “timed”. 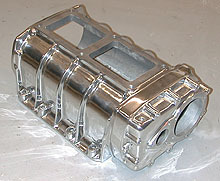 Before I go any further I should mention that a blower can be accidentally put together backwards since the case is cast to be used in either application. 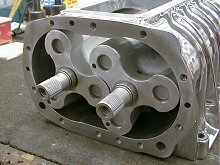 The boltholes for the intake manifold are spaced differently on each side. Make sure you have this correct before you start. The rotors are then timed by setting the large serrations of both rotors at 3:00. Set the seals in the cover plates. Keep the plastic protective guides in the seals. 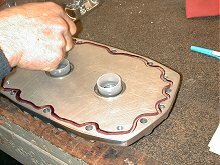 Lay a bead of gasket seal on the rear cover/bearing plate and slide it on carefully. We used two bearing presses as guides to make the job easier. Line up the dowel pins and gently tap the cover in place by hand or with a rubber mallet.